This is a match-4 puzzle game that is based on the TV show Futurama. Instead of matching fruits or gems you are matching Drones and like most games of this nature it tries to entice you into spending real money. Matching is the usual mix of swiping and dragging your finger around. The objective is to basically match more than 4 drones in a move so you acquire the various power-ups. At regular points of the game you will unlock a scene as part of a longer storyline. 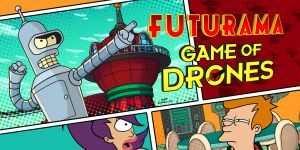 No discussions open for Futurama: Game of Drones at the moment.